In 1966, Richard Cottrell went to see Joe Orton's Looton London's West End and at one point laughed so much he thought he was going to be ill.
45 years on, Cottrell is directing a production of Lootfor Sydney Theatre Company; a play he describes as "terrific but difficult". Now regarded as a comic masterpiece, the first production in 1965 was a flop. Directed by Peter Wood, with an all-star cast that included Geraldine McEwan, Ian McShane and Kenneth Williams, they didn't quite know how to play it and camped it up. It folded after a month. Undeterred, Charles Marowitz directed a new production the following year, which was a huge success, transferring from the Jeannetta Cochrane Theatre to the Criterion on Piccadilly Circus where Cottrell saw it. Not surprisingly, some were shocked and offended by Loot: a sparkling, black-hearted, outrageously explicit, ferociously funny farce that takes satirical aim at police corruption, the Roman Catholic Church, religious hypocrisy and ruthless greed. Nonetheless, it was the hit play of the year and Orton was hailed as British theatre's blazing new star. A year later, he was dead at 34, his skull smashed in with a hammer by his partner Kenneth Halliwell, who then killed himself with an overdose of sleeping pills, mad with jealousy over Orton's success and sexual promiscuity. It was a fate that wouldn't have seemed out of place among the casual, outré violence of Orton's plays. 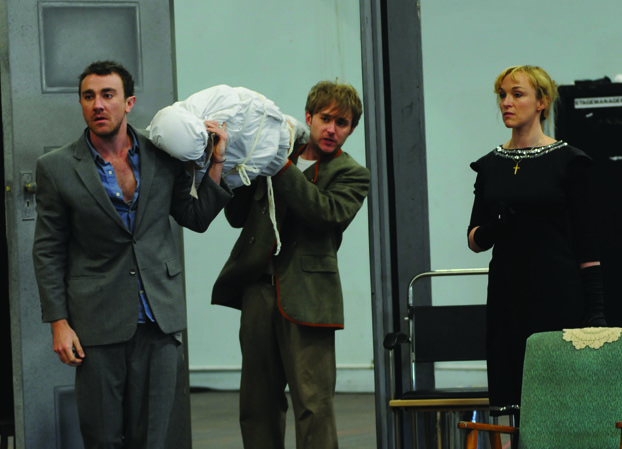 Loot, which stars Darren Gilshenan, Caroline Craig, Robin Goldsworthy, William Zappa and Josh McConville, is set on the day of Mrs. McLeavy's funeral. Her son Hal and his mate Dennis have just robbed a bank. When Detective Inspector Truscott of Scotland Yard arrives - insisting he's from the metropolitan water board - they stuff her corpse into a cupboard so they can stash the money in her coffin. Mrs. McLeavy's nurse Fay, a devout Catholic whose seven husbands have died in quick succession along with many of her patients, agrees to help them - for a cut of the stolen cash. Back in the 1960s, rampant bi-sexuality, bent coppers and murderous nurses were not things you put on stage - and certainly not with Orton's brazen, unapologetic glee. "He was prepared to speak the unspeakable; and this gave the plays their joy and danger," writes John Lahr in the introduction to Methuen's Orton: The Complete Plays. "He had absolutely no respect for tradition, authority or moral codes of conduct and that was what made (his first full-length play) Entertaining Mr. Sloaneand Lootso alarming," says Cottrell. Times have changed and inevitably the play's power to shock isn't what it once was. "I think we've all got long used to police corruption but of course they hadn't then and that caused a lot of outrage," says Cottrell. "Orton said somewhere, 'people don't believe this is true. Scotland Yard knows that it is.'" Truscott was in fact based on a real person: Harold Challenor of the Metropolitan Police who was charged in 1963 with conspiracy to pervert the course of justice. Though police corruption may not shock us anymore, it will certainly strike a chord. "What I don't think will change is people's reaction to Orton's attitude to the church and death because death still remains a sacred cow," says Cottrell, "and I hope Christians will continue to find the play as offensive as Christians did then! Lootis a hard play to get right - but if anyone can do it, it's Cottrell, who was born in England and has a great affinity with British comedy as his STC productions of Travestiesand Ying Tong: A Walk with The Goonsattest. McLeavy: What am I charged with? Truscott: That needn't concern you for the moment. We'll fill in the details later. Truscott: I don't know where you pick up these slogans, sir. You must read them on hoardings. The key to making it work is to play it absolutely for real, believes Cottrell. Orton always insisted that Lootwas "a serious play". "People think I write fantasy, but I don't; some things may be exaggerated or distorted in the same way that painters distort and alter things, but they're realistic figures," he told one interviewer. "The writing is very, very brilliant," says Cottrell. "He wrote with the greatest possible care like [Restoration playwright, William] Congreve - and I think that's the trap. It reads like Congreve but you mustn't direct it like Congreve because it's got to sound natural. So the actors have the difficult road to hoe of respecting the text but not putting it into inverted commas as it were. "Orton seems to have instinctively understood that the basis of farce is the upsetting of bourgeois morality. In Lootthat's what he's doing all the time. But farce doesn't work unless for the actors it's deeply serious." Caroline Craig, who plays the nurse, is thrilled by the challenge. She has loved Orton since she saw the film Prick Up Your Earsas a teenager and read Lahr's biography on which it was based. "I really love the black comedy of it," she says of Loot. "To me it really is kind of like A Clockwork Orangemeets Pinter meets Oscar Wilde. It also has elements of [British comedy troupe] The Mighty Boosh. I love the velocity of the language and the play on words. It uses text as a weapon and also it just flips you on your head all the time. His writing seems really fearless and it has a f-k off energy to it and an anarchic quality that is very exciting." Craig says that she wanted the role so much she has "never worked so hard for an audition. Working with Richard [in the audition room] was really fun. As an actor you want to have a strong objective but he said, 'no, it's too obvious, you're giving the whole game away.' It's true. There has to be that cloak of respectability. She might happen to look like a bombshell and be absolutely conniving but she behaves like a very prim and proper nurse so it will be fun to play with that juxtaposition. I think that's all through the writing. There are these desperate animals clawing underneath these very proper ways of behaving." "I think what is difficult [for the actors] - and should be thrilling for the audience - is that the play is completely heartless: glitteringly, dazzlingly immoral, amoral and heartless," says Cottrell. He and designer Victoria Lamb have opted for a naturalistic set. "That's one of the reasons the first production was a failure," he says. "They did the play on a stylized black and white set in the style of Aubrey Beardsley. Victoria and I decided pretty early on that we should do it naturalistically, in her terms 'in the period' - which was rather a shock to me because, of course, I was there! Loot, Drama Theatre, Sydney Opera House, 16 September - 23 October, 2011.